Find a huge selection of fantastic Foods with great discounts included! Where do I use my Bulk Powders voucher code? Find the code you want on the NetVoucherCodes website, copy the code and follow the link to the Bulk Powders website. Start shopping for your items and head to your shopping cart when you’re finished shopping. Paste your code into the box provided on the basket page and click ‘Apply code’. Then press ‘checkout’ and enter your delivery and bank details to complete the transaction. "Refer a friend for £10 off and 25% off for them." "Up to 25% off with student discount." 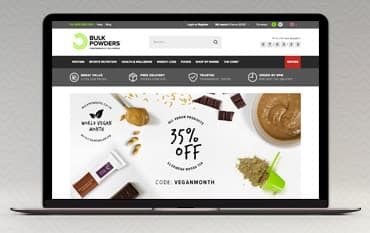 With our BulkPowders discount codes, you can save cash when ordering their top-quality sports nutrition, bodybuilding supplements, whey proteins, healthy snacks and more, as well as a selection of branded t-shirts, bottles and accessories. BulkPowders provide free next-day delivery to UK mainland addresses of £49 and over, with 7-day returns for unwanted products. Bulk Powders regularly run discount codes that will save you money on your online order or perhaps even offer a free gift or free delivery. We here at NetVoucherCodes endeavour to bring our members these codes as soon as they are released, so it is worth checking this page before placing your order. The codes will have an expiry date and sometimes will have terms associated such as a minimum spend or will only be able to be used on specific products, so be quick when you see a code that your order will qualify for so that you don’t miss out on some great savings. Now trading solely online and being based in the UK means that Bulk Powders can offer it’s customers cheap supplements without compromising on quality. They offer a huge range of supplements including, creatine supplements, protein supplements, weight gain supplements, high fibre supplements and many more. Whichever product you choose to purchase you can be assured of the same high quality across the board. The range of protein powder on offer at Bulk Powders is awesome, in a variety of flavours. Their products include whey protein, egg protein, diet protein, beef protein, vegetarian protein, slow release protein, vegan protein, recovery protein and many more options. As well as powders you will find a great range of protein bars, snacks and food, such as protein porridge, liquid egg whites, peanut butter and active meals, all with a great taste and a great price tag attached. How can I contact Bulk Powders? Please call +44 (0)1206 222 018 or 0800 085 2950. When your order has been dispatched you will receive a dispatch confirmation email which will include your tracking number. You have 30 days from the date of delivery to return your order to Bulk Powders. All returns are free. Bulk Powders is a one-stop shop for all your sports nutrition requirements. With one of our Bulk Powders Discount Codes, you can make great savings on performance nutrition & health supplements. Whatever your goal, losing weight, increase muscle mass, gain lean muscle or increase your sports performance Bulk Powders really does cater for everybody. We are constantly on the hunt for first order Discount Codes for Bulk Powders to help you with your money saving. Our experts check dozens of sites for secret codes including NHS discounts, student sites & social media channels saving you time & money!